My busy life has gotten in the way of my crafting lately. I have been making things but have been lazy on taking pictures. So I will try to catch up. We have been busy with basketball, many school events and meetings. We even signed up all 4 kids for baseball. The two lil girls will be on the same team. Yeah! That will be so fun for them. ChaCha will be on the Minor girls team and CJ is on Major Boys again this year. Next year he bumps up to Juniors. WHOA! My kids are growing so fast. Hubby has been busy working very long hours, so every precious moment is spent with us watching movies, playing games, shooting hoops, hanging out or bike riding. I don't see him slowing down anytime soon. We are so fortunate and thankful for the work provided and can't complain. So today...I thought I would share a really cool downloadable goodie I found. You may have seen it. It was featured in Better Homes and Gardens "do it yourself" magazine. It's another cool way to do a growth chart. Cathe from Just Something I Made came up with this marvelous idea. 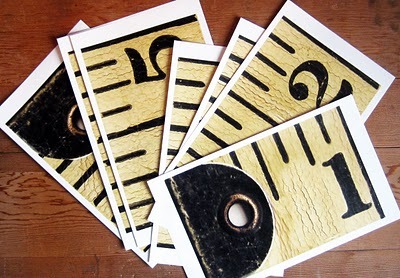 She scanned one of her vintage measuring tapes for you to print out. It's life size and awesome! Visit HERE to download yours. She even has and update at the bottom of the post offering a metric version. Cool! Thanks Cathe for the great download! Be sure to check out all her awesome DIY projects HERE too! She is one, pretty amazing and creative woman! I was lucky to have found her site! Hope you enjoy my fun lil find! One more quick thing...I was playing with a new idea. Pinterest is another fabulous site that I often use. I take it on the go with me all the time on my iPhone. LOL I am sure many of you do too! So here's my thought...what do you think of having a Pinterest Challenge Party? Putting our Pins in motion. LOL I find so many ideas on there that I want to do and haven't. I though if I did it here, I would accomplish more of them. ;o) I thought of either posting a specific pin of mine that we could all make, then link up. That way we can see all the different versions from that one Pin. Or...each week you can link up your own Pinterest Pin that you loved and made yourself. I think it would be a fun way for us to make our favorite pins rather than just dreaming about making them. Ha!Ha! The idea would be to have you post a "How you made your favorite pin" Directions how you made your pin, including photos of yours and the pic of the original pinned inspiration (include their link). Then link it up here at a party to share with others. What do you think? Would that be fun? I can't wait to here what you think! Leave a comment below to let me know. Also, please share this idea with others. Have them come here for a comment too. I would love to see how many would like to be involved in a Pinterest Challenge Party! Thanks All! Have a Perfect Day and a FUN weekend too! I think a Pinterest Challenge Party would be awesome, I too spend hours pinning things I want to do and so far have only made one, and it was a birthday gift for my daughter so there was a timing issue that forced me to complete it. I'll repost your idea on my page www.yankeedoodledesigns.com come by and check me out. Oooh! Lovely! Thank you so much for sharing your find!